A top seller!! 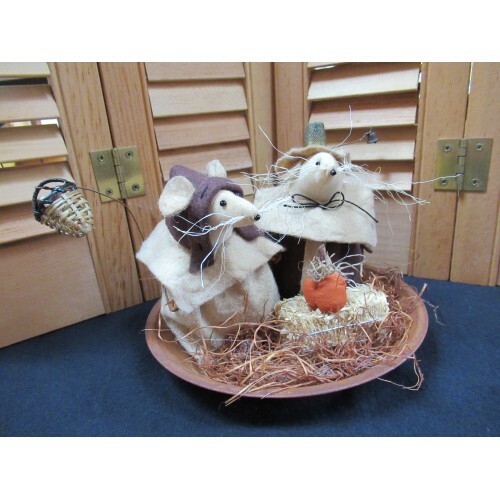 These mice are made from coffee stained muslin. "Miles Mouse" wears a brown wool felt coat with a collar made from coffee stained wool felt. His hat is an old thimble sitting atop a stained muslin brim. "Prudence Mouse" wears a dress made from coffee stained osnaburg with a stained wool felt collar. Her hat is also made from wool felt. Both mice have rusted safety pin arms. 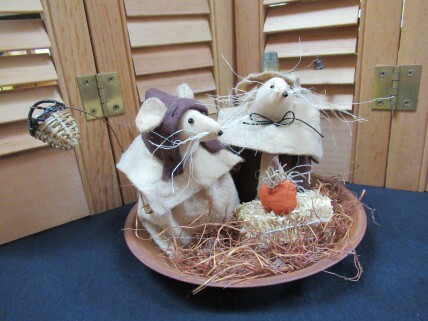 They sit in a 7" rusty pie plate along with a tin hay bale and a handmade pumpkin.